There's a single scene in Cars 2 which goes some way to explaining the fundamental flaws that undermine both this film and its 2006 predecessor. As you are probably aware, these pictures take place in a world entirely inhabited by automobiles – the main characters are cars, the animals are cars and the world appears to exist without the intervention of human beings. In this sequel, Lightning McQueen (Owen Wilson) has been invited to Japan to take part in a race, and he takes his pal Mater (Larry the Cable Guy) along for the ride. They find themselves at a swanky party – again, populated entirely by cars – when Mater eats a large helping of wasabi, having mistaken it for ice cream, and causes an embarrassing scene. We're expected to laugh as he tears around the room looking for water, but instead of laughing I was perplexed. Why on earth is wasabi being served at a cars-only party? How do they even know what wasabi is? Why did Mater believe it was ice cream when, as far as I can tell, he lives in a world without dairy products? Am I overthinking this simple comical scene in a film aimed largely at children? Perhaps, but it illustrates the point that the universe of Cars and Cars 2 doesn't make any sense, and the failure of Pixar to make sense of the universe it is depicting is a rare thing indeed. After all, Pixar has successfully made us believe in and care about toys that come to life, monsters who live in a world accessed through bedroom wardrobes, and a rat with the skills of a gourmet chef over the past decade. Perhaps it's the complete absence of a human factor that makes the Cars universe feel so cold and meaningless, but whatever the reason, John Lasseter's first film in this series is widely regarded as the studio's weakest, and this follow-up is surely the least anticipated film Pixar has ever made. It was also perhaps the most inevitable. 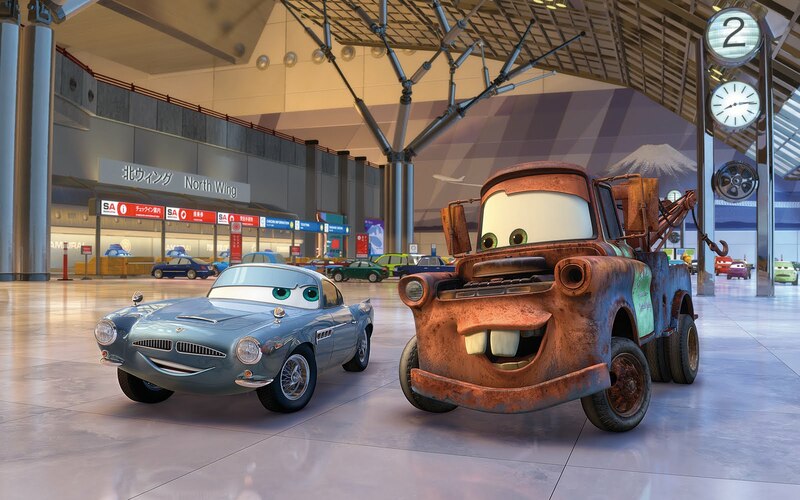 Cars has proven to be a huge financial success for Disney and Pixar, with the already considerable box-office takings of the first film being augmented by Cars-related merchandise that has outsold that of all other Pixar releases, and such a windfall means the same thing to them as it does to any other studio – time for a sequel. At the very least, we can commend Lasseter for taking his film in an entirely new direction for this second instalment; after the drearily homiletic Doc Hollywood retread of the original, Cars 2 is an action movie, with more than a nod in the direction of James Bond films (and the underrated comedy The Man Who Knew Too Little). Michael Caine joins the cast as a sleek, gadget-laden spy car called Finn McMissile, who is investigating a mysterious crime syndicate that has something to do with the forthcoming World Grand Prix. While Lightning McQueen is taking part in this event, Mater blunders into the espionage plot, having been mistaken by Finn and Holley Shiftwell (Emily Mortimer) as an American agent, whose idiotic demeanour is simply an ingenious cover. Alas, Mater's stupidity is all too real, and while this character might be bearable enough as a comic foil, his promotion to the position of central protagonist here is a serious misstep. Mater is irritating beyond belief, with his dim-witted behaviour and goofy hillbilly drawl immediately proving to be grating in a larger role. He has some amusing moments – such as a disastrous encounter with a high-tech Japanese toilet – but as the laborious plot (which will likely prove too complicated for the young viewers the film is aimed at) unfolded, I frequently wished Lasseter would take the spotlight away from this annoying sidekick masquerading as a lead. The problem is that there are few other places for Lasseter to focus on that are more interesting; Lightning McQueen remains a thoroughly boring hero, and the new characters (John Turturro's smug Italian F1 car, Eddie Izzard's eccentric billionaire) fail to make any kind of memorable impact. Cars 2 is the least engaging film they have yet made because there's nothing here to care about; there is a surprising amount of gunplay, and plenty of moments when the characters are placed in peril, but not once do you feel there is anything of value at stake. In fact, it feels like a lot of the attention that should have been focused on the stories and characters has instead been spent detailing the world they live in. Cars 2 is beautifully animated throughout, from the spectacular oil rig opening sequence to the neon lights of Tokyo and a wittily designed London. It's a feast for the eyes but there is nothing beneath that handsome surface. Will Cars 2 make a lot of money for Pixar? Yes. Will they make better, more original films than this in the future? Of course they will; but one still can't help being disappointed that a studio which has spent over 15 years extolling the virtues of story, character and imagination above all else has made a film that feels so tired, empty and nakedly commercial. One might argue that this mediocre offering from Pixar is still a cut above most of what passes for mainstream children's entertainment these days, and that's a fair point, but if we hold Pixar to a higher standard than everyone else, it is simply because they have made themselves the standard for everyone else.